Xerox Colour Impressions SRA3 - the professionals choice for digital printing. 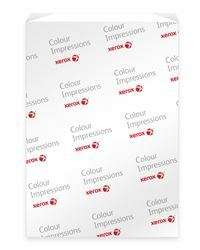 Xerox Colour Impressions is a premium paper designed specifically to give excellent results in digital colour printers. With a very smooth surface, high opacity and bright white shade, Xerox Colour Impressions SRA3 will give a professional finish to your office and production colour documents. It is particularly suited to graphical and colour prints. For a professional finish to your office and production colour documents.